As I explore the VSTS 2010 CTP, I find more and more to like about it. 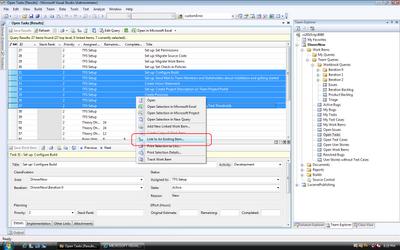 My latest favorite is the ability to setup true work item hierarchies. You could fake this with linking work items in 2005 and 2008, but now these types of relationships are first class citizens. You can now click on a work item in a results view (or select multiple work items) and the context menu now has an option to 'Link to An Existing Item'. 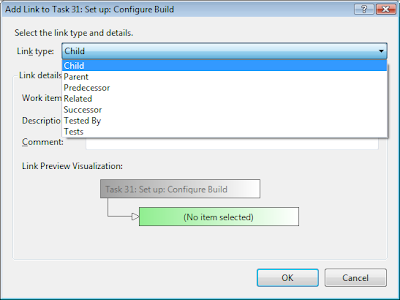 This brings up a dialog that allows you to choose a link type (from choices such as Parent, Child, Predecessor, etc.) and then shows you a visual representation of the link type. There is also a new results view that shows these hierarchies. Another great thing about these views is the ability to drag an item under another item and it automatically make the parent/child links. My only issue is that this new 'tree view' style results view is a little murky in showing items under another item. 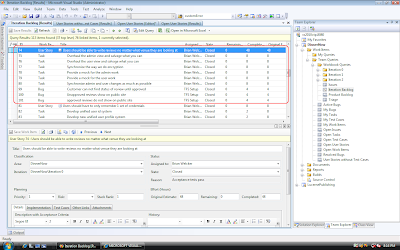 In the screenshot above you can see the tasks and bugs related to the user story but there is not a very clear distinction. Hopefully they will fix this in the next release. This is something I have wanted for a long time to help with Product Backlog and Sprint Backlog management inside TFS and I cannot wait to start working with it for real! I'd very much like to take a look at your software, but do I really have to download an entire VPC image for that? I currently use the Conchango template, but I saw some very interesting features on your site. Does this include your own Scrum process template for TFS? If I could download an installer I would be glad to take a look.